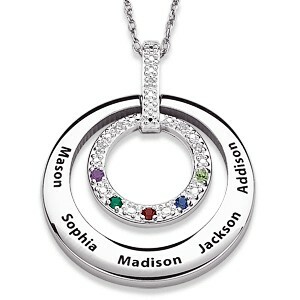 Mothers Necklace with Kids Names - Thrill Mom This Year! 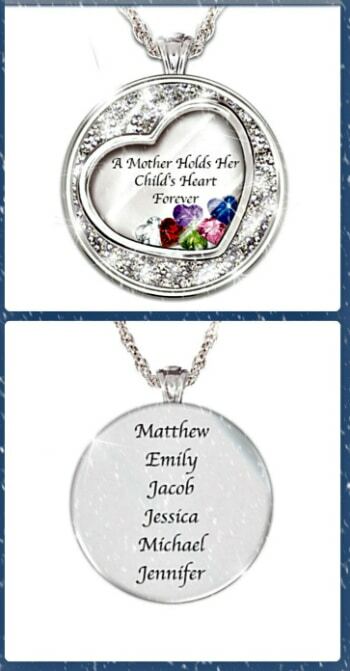 A mothers necklace with kids names is the perfect gift to make Mother’s Day, Christmas or her birthday memorable! 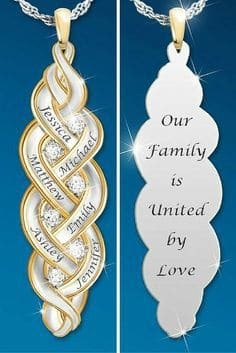 This unique family tree necklace is the perfect way to show Mom she is loved by the whole family. 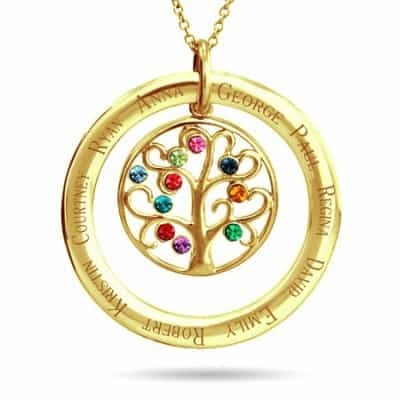 The stunning pendant is truly personalized, displaying the names of up to 7 family members and loved ones while gleaming brightly with the corresponding beautiful birthstones. A perfect gift that can be from the entire family! Keep your loved ones close to your heart with this gorgeous intertwined heart necklace. Available in your choice of silver, gold-plate or hard to find rose gold, this necklace is sure to be your favorite piece of jewelry! The stylish pendant on this elegant diamond necklace keeps the whole family circle close to Mom’s heart. 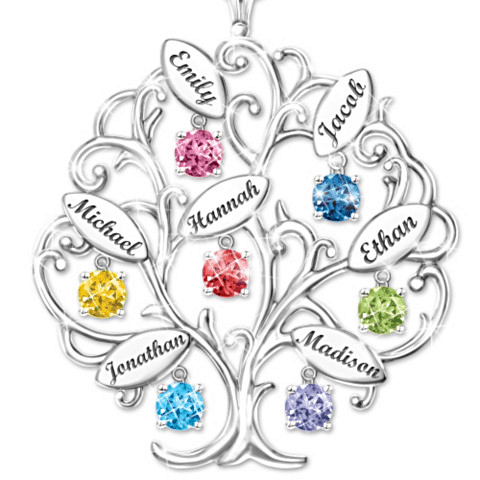 The pendant displays laser-engraved names of loved ones, with five corresponding Austrian crystal birthstones that make for an enchanting piece of jewelry. This is an ideal gift from the whole family, and is guaranteed to put a smile on Mom’s face. This name charm necklace is crafted and engraved by hand, ensuring that it is sincerely one-of-a-kind. 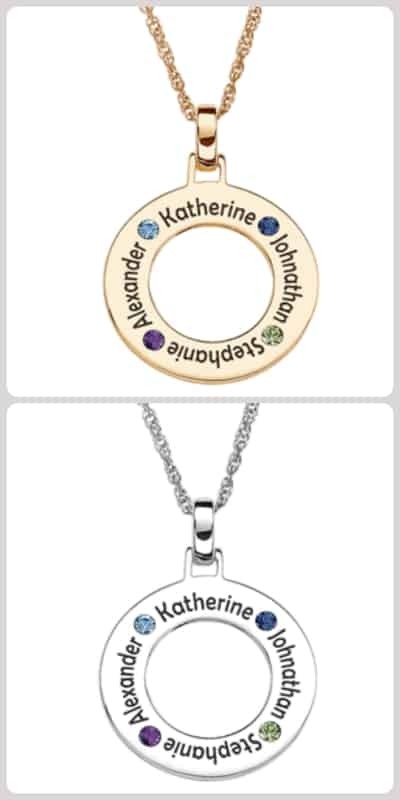 The charms are connected to the sterling silver chain by a Swarovski crystal birthstone, and can feature writing on both sides of the paper-thin pendant for ultimate customization. The number of pendants you add to the chain is up to you, meaning this is the perfect gift for Mom from one son or daughter, or from the entire family. You can even add additional charms later if your family expands. The ideal gift for the Mom or Grandma of a large and loving family! 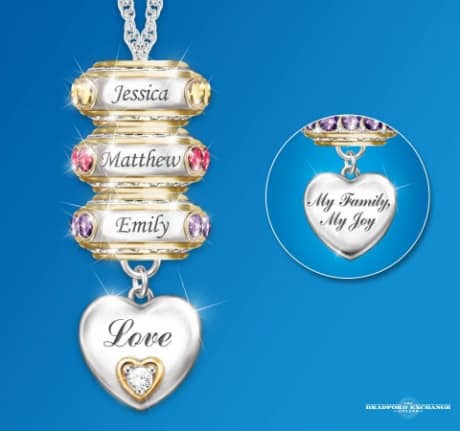 This highly personalized features the names of up to 10 family members and loved ones, with sparkling Swarovski crystal birthstones that combine to make a truly cherished gift this Mother’s Day. This is the gift that keeps on giving, constantly reminding Mom of the love her family has for her. This shimmering necklace is exquisitely handcrafted, and does a perfect job of reminding Mom how much she is loved by each of her children, every day that she wears it. The pendant is sterling silver-plated, and has a heart-shaped window that holds the heart-shaped birthstones of up to 6 children. Each child’s name is engraved on the reverse of the charm. Striking sterling silver is the perfect choice for the mom or grandma who prefers a simpler style without birthstones. Add up to 5 discs, each engraved with the name of a loved one. 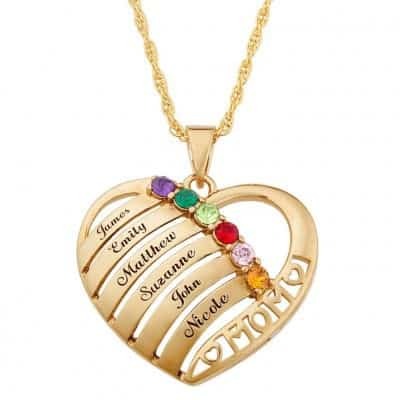 A rainbow of beautiful birthstones complements up to 6 laser-engraved names of children and loved ones on a heart-shaped charm to make this sweet necklace the ultimate gift for putting a smile on Mom’s face this Mother’s Day. The word “MOM” is cut-out on one side of the charm, and accented with a heart-shape on each side – a stunning way to represent Mom’s love for her family! This trendy necklace features up to 5 nameplates – a unique look for the fashionable Mom! 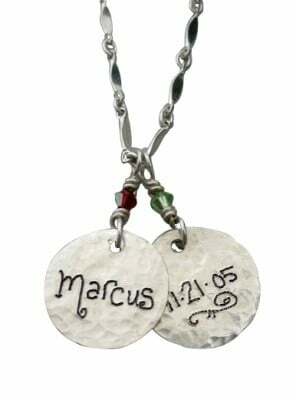 Each hand-cut name charm measures about 1/2″ high. The length of the charm will vary with the name. You can also order additional charms if your family gains any new members! 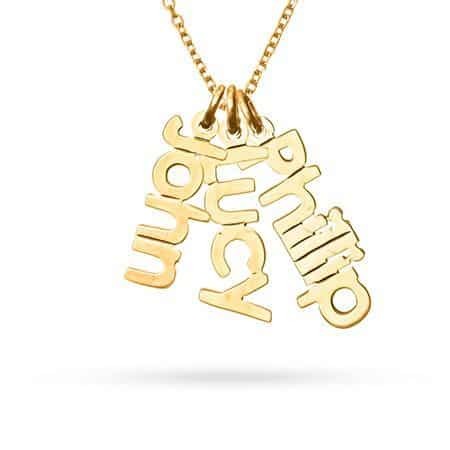 A superb Mother’s Day gift from Mom’s wonderful kids and grandkids, this stylish diamond necklace features hand-engraved names of up to six children, friends, or loved ones. The center of the necklace features a spinning heart shape that glitters with genuine diamonds. 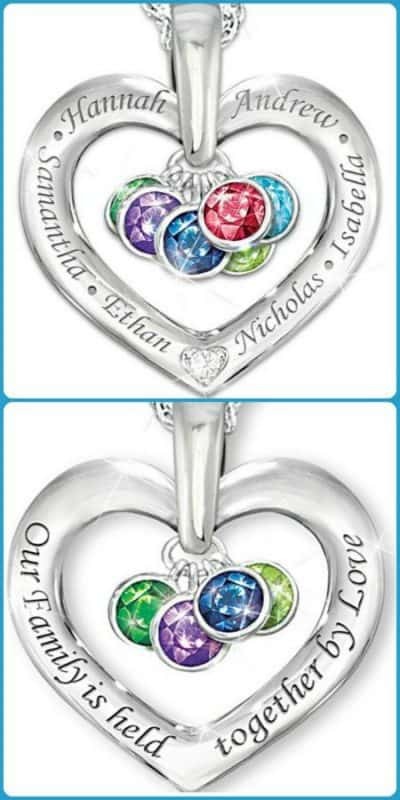 Two larger solid sterling silver heart charms surround the diamond and feature the family member’s names. This one-of-a-kind sparkling necklace will make Mom the center of attention this Mother’s Day, and will show her how much her family and loved ones care for her. This delightful piece of jewelry features the names of up to 6 family members, each engraved on a beautiful interchangeable roundel charm. Each charm is accented with genuine Swarovski crystal birthstones and accented with 24k gold plating. The necklace is further accented with a heart-shaped charm at the bottom that features the word “Love” on one side, and “My Family, My Joy” on the other. This elegant keepsake pendant lets Mom know that she is surrounded by loved ones. It features her three-initial monogram prominently displayed in the center of the pendant, with laser-engraved names of up to 4 family members and loved ones surrounding the initials. The addition of the corresponding birthstones ties the pendant together beautifully, and ensures Mom will feel very special on her big day. This diamond and birthstone necklace celebrates the unique and meaningful bond between Mom and her beloved family, and is a Mother’s Day gift that she will adore and remember forever. The special open-heart design is adorned with the name of up to 6 family members and loved ones, and allows room for 6 dangling crystal birthstones, so that Mom’s family members are always kept in her heart. 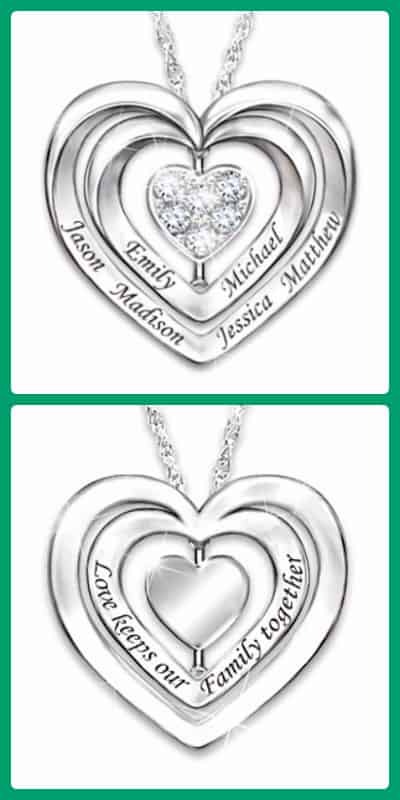 The pendant includes a genuine white diamond set into the bottom of the heart, and the inscription “Our Family is held together by Love” on the back, completing a gift that will warm Mom’s heart. This pure gold necklace is a stunning piece of jewelry that will capture Mom’s heart. 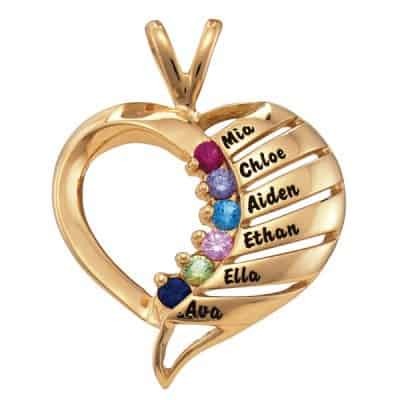 The sleek styling of this pendant is adorned with names of up to 6 children or loved ones, paired with your choice of Swarovski or Genuine birthstones, and will make Mom’s jaw drop in awe. A truly remarkable piece of jewelry, this is a necklace that Mom will never want to take off. Click here to see the necklace in sterling silver. The simple and sleek design of this family birthstone necklace will bring a smile to Mom’s face, as she gets to hold her family and loved ones close to her heart this Mother’s Day. Featuring up to 5 names with corresponding Austrian crystal birthstones, it is the ideal way for a whole family to show Mom their love and appreciation. Set on sterling silver with scratch-resistant plating, this custom necklace is sure to be one of Mom’s favorite gifts of all time. Click here to ﻿﻿view﻿﻿ this necklace in gold. This gorgeous necklace is sure to be Mom’s most treasured piece of jewelry. Featuring up to 6 names engraved on sterling silver-plated links, and accented by 18K gold and 6 genuine diamonds, there’s no better way to make your Mom or Grandma feel truly special. The necklace will have Mom positively gleaming from the appreciation she feels, and will put a huge smile on her face this Mother’s Day. Stacked cup hand stamped necklace is the perfect choice for the fashionable Mom or Grandma! Three cupped discs nestle inside each other, each imprinted with loved ones' names. Add a pearl or birthstone for just the right amount of sparkle! Made from 14K white or yellow gold, and available in sterling silver as well, this necklace is the perfect way to show Mom that she is the piece of the puzzle holds the family together. 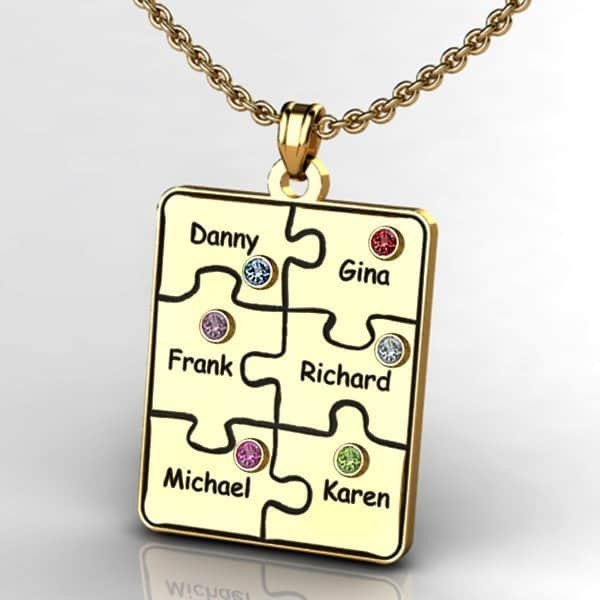 The puzzle necklace is particularly customizable, featuring different arrangements of between 1 and 6 puzzle pieces, each displaying the name of a family member or loved one. The pieces have the option of adding a birthstone to them as well, making for a distinctive necklace that Mom will cherish.